It seems a long time since 8th edition hit the shelves. The pre-order countdown, the buzz on the internet, the wait for the parcel to arrive, it all built up to an exciting wait for this old nerd. But then one thing or another seemed to get in the way of actually playing the game, until last night. Finally, the moment of truth arrived, my Chaos Warriors took to the field against an Empire army. The game was a straight forward pitched battle and we left out the terrain effect charts, we were just concentrating on the rules changes. Having read quite a few forum posts about how vicious and quick the new game was, I was expecting a bloodbath. For my army I pretty much stuck with my old style of small blocks of warriors (12 strong) and slightly larger units of marauders (18 strong), with a unit of 5 knights and 5 marauder horse and a couple of characters, one of which was a sorceror so I could try the new magic rules. My only change from 7th edition was to bump up a unit of ogres to 6 strong, to see how monstrous infantry performed. The Empire army was similarly built along fairly traditional lines, though there was a horde of 40 spearmen to contend with and a big unit of 12 knights. The rest were fairly typical blocks of 20 melee troops or 10 missile troops, with some elite/special infantry in smaller blocks. I like the new movement phase, it's clean and easier than of old, no problems encountered. Charges are much easier to resolve, the random element can seem a nuisance but it's clear that the game is no longer about getting the charge so this turned out to be less of a concern to me than I first thought it might. The new magic phase is a blast (ha ha). The random winds of magic, the casting restrictions (or lack of), it just seemed more exciting. We both managed to get off a handful of spells, but none caused massive casualties, even the much feared Infernal Gateway was not devestating. We both threw plenty of dice to cast, but not one irresistible force came up. Shooting had a bigger impact, artillery are obviously much improved without having to guess ranges. I was certainly glad that my marauder horse were able to take out the cannon after it's first shot blew away 2 ogres and a chaos knight. Anti-artillery measure will definitely be uppermost in my mind when I make future lists. Combat was more involved. I like the fact that the whole unit gets involved in rolling some dice, not just standing at the back of the unit to make up the rank bonus. In one combat between 40 spearmen and 18 marauders with flails, there were half a dozen casualties each side, but most of the other combats were much like 7th edition in style, with just 1 or 2 per side. This might have been down to the heavy armour saves of the chaos warriors of Tzeentch and the Empire knights, so more games will be needed before I can say too much here, but it felt reasonably balanced to me. I was pleased that my chaos knights still managed to carve a fairly bloody trail through the enemy, just at a slightly slower pace maybe than of old. I really enjoyed the game, the rules seem well laid out and pretty logical, with less "fiddling" and guessing in game. The changes it will cause to my armies are minimal, though I have always collected infantry blocks as the core of my armies, with cavalry, shooting and magic as support elements, so maybe it's just a case of the current game designers having a similar mindset to my own. I can't wait to get more games in, trying out my other armies and moving on to the scenarios in the back of the book. I am one excited old nerd! A blast from the past! 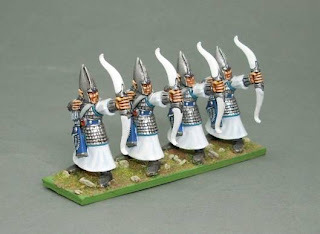 These archers are the first Warhammer models I bought, way back in 1992 or 1993. They are the single pose plastic models that were included in the Warhammer fourth edition box set, which was the first time GW released the game as a starter set with miniatures, rule book, etc. Since then, the game has gone through several versions, with the most recent being 8th edition of course, currently available in rule book only. There will be a starter set released later in the year and it's been confirmed that the two armies will be Skaven and High Elves. In the nearly twenty years that I have been playing the game, I have collected a lot of armies. Starting with these elves, I moved on to Undead (as they were in the 1990's, none of the distinction back then between Tomb Kings and Vampire Counts, mummies and zombies happily shuffling along together). Then came Chaos, several of these in fact, including a chaos dwarf army. After about 10 years, I stopped gaming and sold off or shelved my many armies. 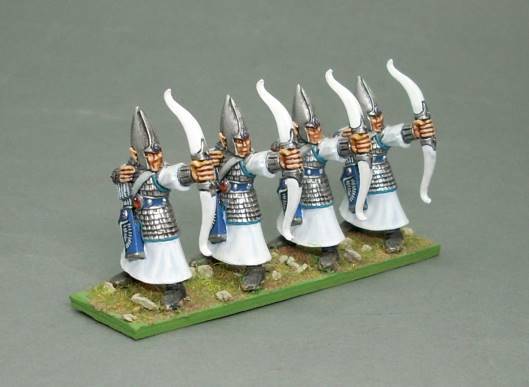 But the High Elf army, my first ever Warhammer purchase, I kept. Recent whispers and pictures of the upcoming starter set, along with the GW announcement that High Elves will be getting more models in the autumn, has got me excited about them once more. I am seriously considering them as my next army. I have a fair amount already painted, some of which I could easily update to fit in with my current style. The time seems right for the Glittering Host to take to the field once more. A trio of trolls added to the army. The centre one is possibly the most numerous troll in existence, being part of the Skull Pass boxset, but the other two are a bit less frequently seen, being Reaper models. They have been painted in fairly sombre colours, I wanted to play down the more comic aspect often portrayed in trolls. In gaming terms I have fielded them as common trolls in this unit of three, generally they are good against knights and smaller units. They give me some speed and hitting power (stupidity allowing), which is quite handy in my infantry heavy army. Next to be painted? I do have three more trolls which I have spent several weeks patiently sifting through ebay to acquire. 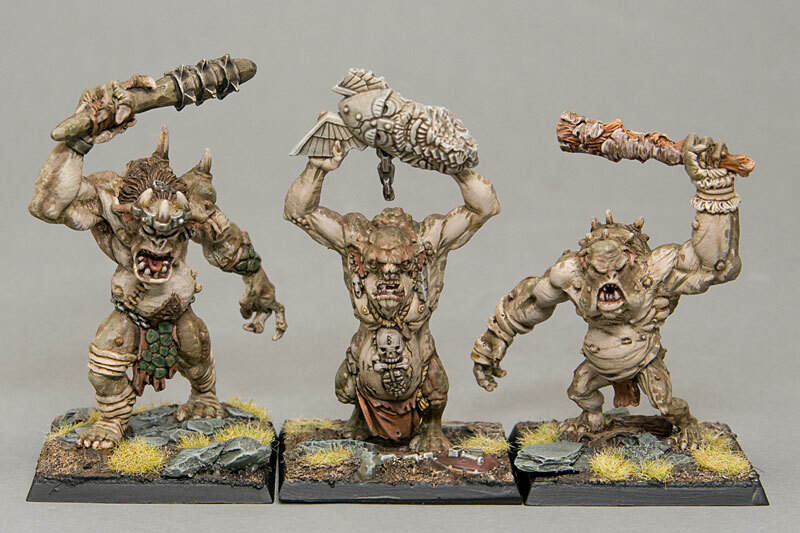 These new models are earmarked as stone trolls, but I could also field them in 8th as one large unit of 6 trolls, which by all accounts will be quite powerful in combat. I also have a giant, artillery and many more infantry waiting for some brush attention. And I got a set of the new boar boyz which I will probably allocate to a couple of chariots. While I make up my mind, I have switched back to 40k for a brief interlude, though still green skinned.